Graph theory is the an area of mathematics that analyses relationships between pairs of objects. 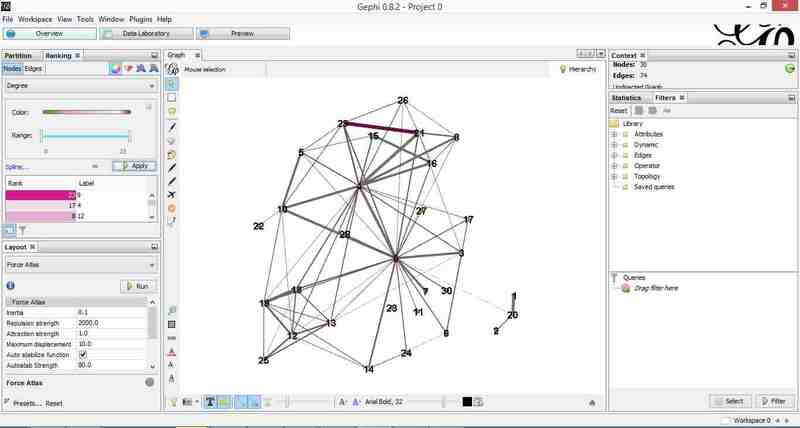 Typically graphs consist of nodes (points representing objects) and edges (lines depicting relationships between objects). As one might imagine, graphs are extremely useful in visualizing relationships between objects. 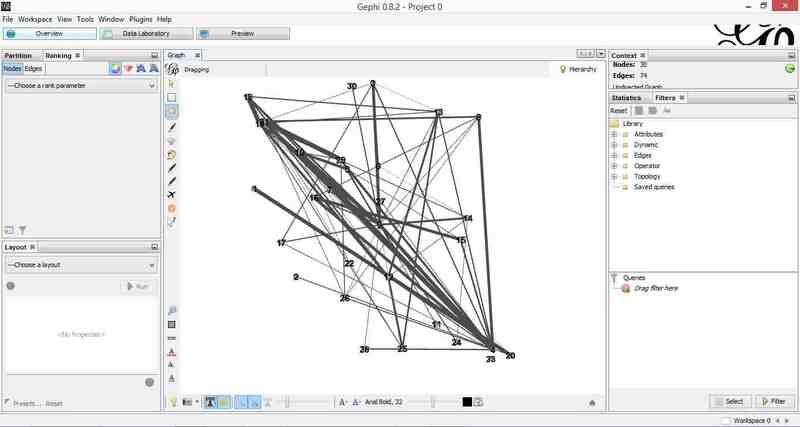 In this post, I provide a detailed introduction to network graphs using R, the premier open source tool statistics package for calculations and the excellent Gephi software for visualization. 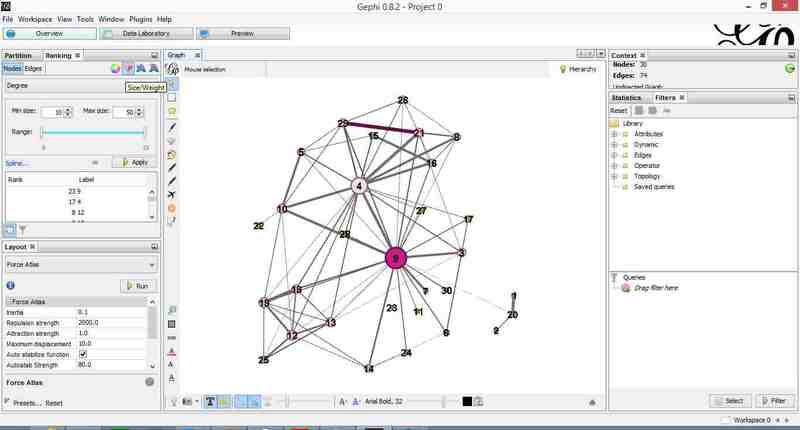 The article is organised as follows: I begin by defining the problem and then spend some time developing the concepts used in constructing the graph Following this, I do the data preparation in R and then finally build the network graph using Gephi. In an introductory article on cluster analysis, I provided an in-depth introduction to a couple of algorithms that can be used to categorise documents automatically. Although these techniques are useful, they do not provide a feel for the relationships between different documents in the collection of interest. 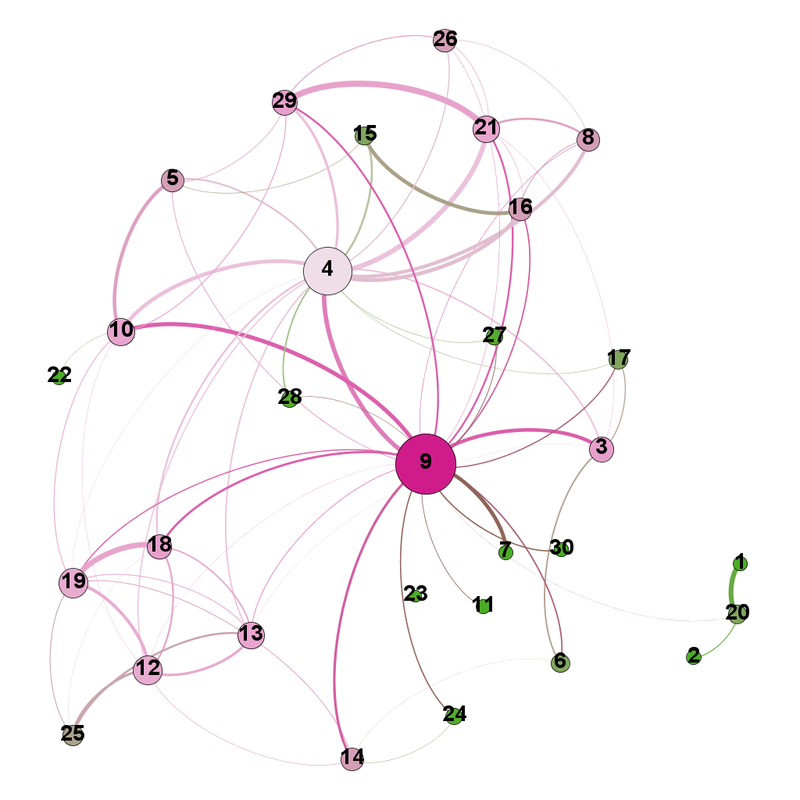 In the present piece I show network graphs can be used to to visualise similarity-based relationships within a corpus. There are many ways to quantify similarity between documents. A popular method is to use the notion of distance between documents. The basic idea is simple: documents that have many words in common are “closer” to each other than those that share fewer words. The problem with distance, however, is that it can be skewed by word count: documents that have an unusually high word count will show up as outliers even though they may be similar (in terms of words used) to other documents in the corpus. For this reason, we will use another related measure of similarity that does not suffer from this problem – more about this in a minute. As I explained in my article on cluster analysis, a document can be represented as a point in a conceptual space that has dimensionality equal to the number of distinct words in the collection of documents. I revisit and build on that explanation below. Say one has a simple document consisting of the words “five plus six”, one can represent it mathematically in a 3 dimensional space in which the individual words are represented by the three axis (See Figure 1). Here each word is a coordinate axis (or dimension). Now, if one connects the point representing the document (point A in the figure) to the origin of the word-space, one has a vector, which in this case is a directed line connecting the point in question to the origin. Specifically, the point A can be represented by the coordinates in this space. This is a nice quantitative representation of the fact that the words five, plus and one appear in the document exactly once. Note, however, that we’ve assumed the order of words does not matter. This is a reasonable assumption in some cases, but not always so. As another example consider document, B, which consists of only two words: “five plus” (see Fig 2). Clearly this document shares some similarity with document but it is not identical. Indeed, this becomes evident when we note that document (or point) B is simply the point $latex(1, 1, 0)$ in this space, which tells us that it has two coordinates (words/frequencies) in common with document (or point) A. To be sure, in a realistic collection of documents we would have a large number of distinct words, so we’d have to work in a very high dimensional space. Nevertheless, the same principle holds: every document in the corpus can be represented as a vector consisting of a directed line from the origin to the point to which the document corresponds. Now it is easy to see that two documents are identical if they correspond to the same point. In other words, if their vectors coincide. On the other hand, if they are completely dissimilar (no words in common), their vectors will be at right angles to each other. What we need, therefore, is a quantity that varies from 0 to 1 depending on whether two documents (vectors) are dissimilar(at right angles to each other) or similar (coincide, or are parallel to each other). Now here’s the ultra-cool thing, from your high school maths class, you know there is a trigonometric ratio which has exactly this property – the cosine! 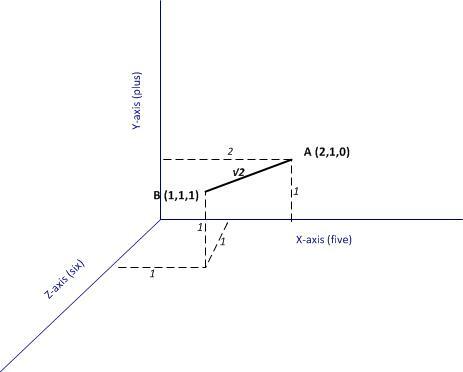 where the two vectors are and , and is the angle between the two vectors (see Fig 2). The upshot of the above is that the cosine of the angle between the vector representation of two documents is a reasonable measure of similarity between them. This quantity, sometimes referred to as cosine similarity, is what we’ll take as our similarity measure in the rest of this article. If we have a collection of documents, we can calculate the similarity between every pair of documents as we did for A and B in the previous section. This would give us a set of numbers between 0 and 1, which can be conveniently represented as a matrix. This is sometimes called the adjacency matrix. Beware, though, this term has many different meanings in the math literature. I use it in the sense specified above. Since every document is identical to itself, the diagonal elements of the matrix will all be 1. These similarities are trivial (we know that every document is identical to itself!) so we’ll set the diagonal elements to zero. Another important practical point is that visualizing every relationship is going to make a very messy graph. There would be edges in such a graph, which would make it impossible to make sense of if we have more than a handful of documents. For this reason, it is normal practice to choose a cutoff value of similarity below which it is set to zero. We now have enough background to get down to the main point of this article – visualizing relationships between documents. The rows of a DTM are document vectors akin to the vector representations of documents A and B discussed earlier. The DTM therefore contains all the information we need to calculate the cosine similarity between every pair of documents in the corpus (via equation 1). The R code below implements this, after taking care of a few preliminaries. #adjacency matrix: set entries below a certain threshold to 0. First up, although the DTM is a matrix, it is internally stored in a special form suitable for sparse matrices. We therefore have to explicitly convert it into a proper matrix before using it to calculate similarity. Second, the names I have given the documents are way too long to use as labels in the network diagram. I have therefore mapped the document names to the row numbers which we’ll use in our network graph later. The mapping back to the original document names is stored in filekey.csv. For future reference, the mapping is shown in Table 1 below. The last three lines of code above simply implement the cutoff that I mentioned in the previous section. The comments explain the details so I need say no more about it. …which finally brings us to Gephi. Gephi is an open source, Java based network analysis and visualisation tool. Before going any further, you may want to download and install it. While you’re at it you may also want to download this excellent quick start tutorial. To begin with, there’s a little formatting quirk that we need to deal with. Gephi expects separators in csv files to be semicolons (;) . So, your first step is to open up the adjacency matrix that you created in the previous section (AdjacencyMatrix.csv) in a text editor and replace commas with semicolons. Once you’ve done that, fire up Gephi, go to File > Open, navigate to where your Adjacency matrix is stored and load the file. If it loads successfully, you should see a feedback panel as shown in Figure 3. 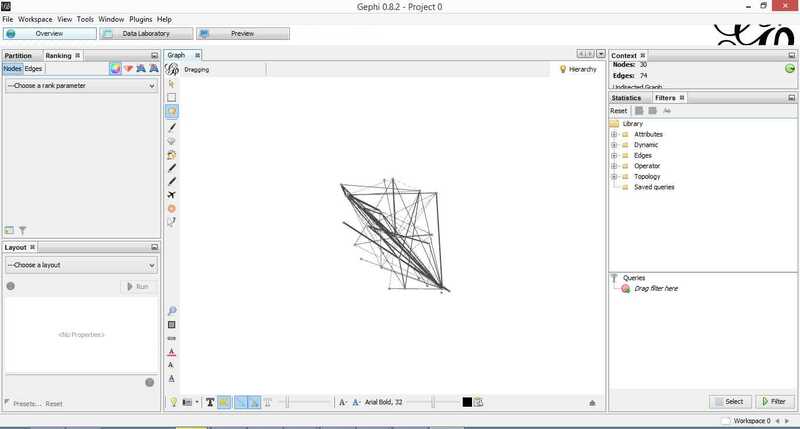 By default Gephi creates a directed graph (i.e one in which the edges have arrows pointing from one node to another). Change this to undirected and click OK.
Once that is done, click on overview (top left of the screen). You should end up with something like Figure 4. Gephi has sketched out an initial network diagram which depicts the relationships between documents…but it needs a bit of work to make it look nicer and more informative. 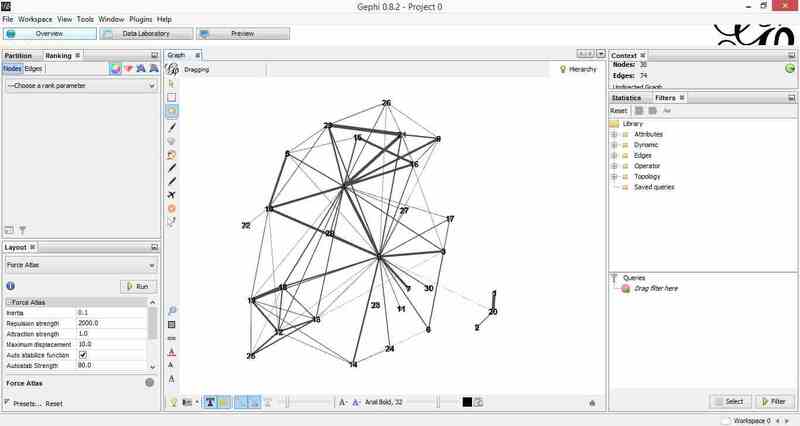 The quickstart tutorial mentioned earlier describes various features that can be used to manipulate and prettify the graph. In the remainder of this section, I list some that I found useful. Gephi offers many more. Do explore, there’s much more than I can cover in an introductory post. Zoom and pan using mouse wheel and right button. Adjust edge thicknesses using the slider next to text formatting options on bottom left of main panel. Re-center graph via the magnifying glass icon on left of display panel (just above size adjuster). Toggle node labels on/off by clicking on grey T symbol on bottom left panel. Figure 5 shows the state of the diagram after labels have been added and edge thickness adjusted (note that your graph may vary in appearance). The default layout of the graph is ugly and hard to interpret. Let’s work on fixing it up. To do this, go over to the layout panel on the left. Experiment with different layouts to see what they do. After some messing around, I found the Fruchtermann-Reingold and Force Atlas options to be good for this graph. In the end I used Force Atlas with a Repulsion Strength of 2000 (up from the default of 200) and an Attraction Strength of 1 (down from the default of 10). I also adjusted the figure size and node label font size from the graph panel in the center. The result is shown in Figure 6. This is much better. For example, it is now evident that document 9 is the most connected one (which table 9 tells us is a transcript of a conversation with Neil Preston on organisational change). It would be nice if we could colour code edges/nodes and size nodes by their degree of connectivity. This can be done via the ranking panel above the layout area where you’ve just been working. In the Nodes tab select Degree as the rank parameter (this is the degree of connectivity of the node) and hit apply. Select your preferred colours via the small icon just above the colour slider. Use the colour slider to adjust the degree of connectivity at which colour transitions occur. Do the same for edges, selecting weight as the rank parameter(this is the degree of similarity between the two douments connected by the edge). With a bit of playing around, I got the graph shown in the screenshot below (Figure 7). Figure 5: Connectivity-based colouring of edges and nodes. If you want to see numerical values for the rankings, hit the results list icon on the bottom left of the ranking panel. 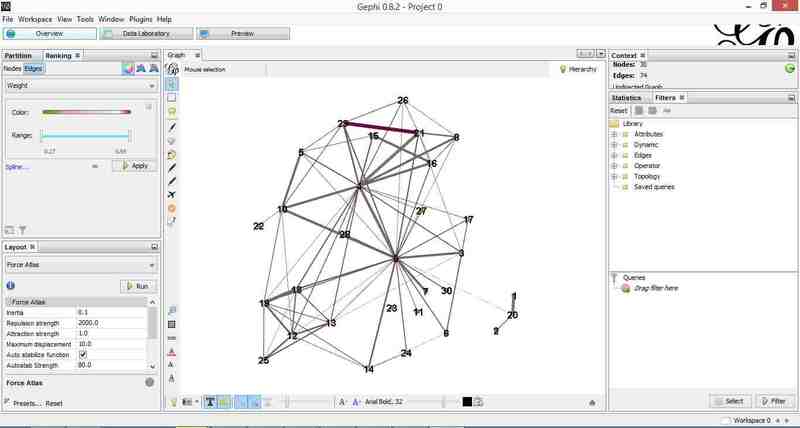 You can see numerical ranking values for both nodes and edges as shown in Figures 8 and 9. It is easy to see from the figure that documents 21 and 29 are the most similar in terms of cosine ranking. This makes sense, they are pieces in which I have ranted about the current state of enterprise architecture – the first article is about EA in general and the other about the TOGAF framework. If you have a quick skim through, you’ll see that they have a fair bit in common. Finally, it would be nice if we could adjust node size to reflect the connectedness of the associated document. You can do this via the “gem” symbol on the top right of the ranking panel. Select appropriate min and max sizes (I chose defaults) and hit apply. The node size is now reflective of the connectivity of the node – i.e. the number of other documents to which it is cosine similar to varying degrees. The thickness of the edges reflect the degree of similarity. See Figure 10. Hit refresh after making the above adjustments. You should get something like Fig 11. All that remains now is to do the deed: hit export SVG/PDF/PNG to export the diagram. My output is displayed in Figure 12. 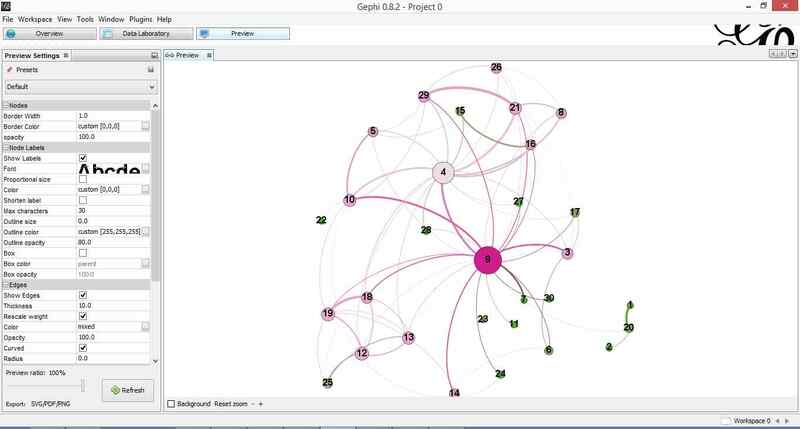 It clearly shows the relationships between the different documents (nodes) in the corpus. The nodes with the highest connectivity are indicated via node size and colour (purple for high, green for low) and strength of similarity is indicated by edge thickness. …which brings us to the end of this journey. The techniques of text analysis enable us to quantify relationships between documents. Document similarity is one such relationship. Numerical measures are good, but the comprehensibility of these can be further enhanced through meaningful visualisations. Indeed, although my stated objective in this article was to provide an introduction to creating network graphs using Gephi and R (which I hope I’ve succeeded in doing), a secondary aim was to show how document similarity can be quantified and visualised. I sincerely hope you’ve found the discussion interesting and useful. Many thanks for reading! As always, your feedback would be greatly appreciated. The standard way to search for documents on the internet is via keywords or keyphrases. This is pretty much what Google and other search engines do routinely…and they do it well. However, as useful as this is, it has its limitations. Consider, for example, a situation in which you are confronted with a large collection of documents but have no idea what they are about. One of the first things you might want to do is to classify these documents into topics or themes. Among other things this would help you figure out if there’s anything interest while also directing you to the relevant subset(s) of the corpus. For small collections, one could do this by simply going through each document but this is clearly infeasible for corpuses containing thousands of documents. The article is organised as follows: I first provide some background on topic modelling. The algorithm that I use, Latent Dirichlet Allocation (LDA), involves some pretty heavy maths which I’ll avoid altogether. However, I will provide an intuitive explanation of how LDA works before moving on to a practical example which uses the topicmodels library in R. As in my previous articles in this series (see this post and this one), I will discuss the steps in detail along with explanations and provide accessible references for concepts that cannot be covered in the space of a blog post. (Aside: Beware, LDA is also an abbreviation for Linear Discriminant Analysis a classification technique that I hope to cover later in my ongoing series on text and data analytics). In essence, LDA is a technique that facilitates the automatic discovery of themes in a collection of documents. The basic assumption behind LDA is that each of the documents in a collection consist of a mixture of collection-wide topics. However, in reality we observe only documents and words, not topics – the latter are part of the hidden (or latent) structure of documents. The aim is to infer the latent topic structure given the words and document. LDA does this by recreating the documents in the corpus by adjusting the relative importance of topics in documents and words in topics iteratively. This assignment already gives you both topic representations of all the documents and word distributions of all the topics (albeit not very good ones). ……..In other words, in this step, we’re assuming that all topic assignments except for the current word in question are correct, and then updating the assignment of the current word using our model of how documents are generated. After repeating the previous step a large number of times, you’ll eventually reach a roughly steady state where your assignments are pretty good. So use these assignments to estimate the topic mixtures of each document (by counting the proportion of words assigned to each topic within that document) and the words associated to each topic (by counting the proportion of words assigned to each topic overall). For another simple explanation of how LDA works in, check out this article by Matthew Jockers. For a more technical exposition, take a look at this video by David Blei, one of the inventors of the algorithm. The iterative process described in the last point above is implemented using a technique called Gibbs sampling. I’ll say a bit more about Gibbs sampling later, but you may want to have a look at this paper by Philip Resnick and Eric Hardesty that explains the nitty-gritty of the algorithm (Warning: it involves a fair bit of math, but has some good intuitive explanations as well). As a general point, I should also emphasise that you do not need to understand the ins and outs of an algorithm to use it but it does help to understand, at least at a high level, what the algorithm is doing. One needs to develop a feel for algorithms even if one doesn’t understand the details. Indeed, most people working in analytics do not know the details of the algorithms they use, but that doesn’t stop them from using algorithms intelligently. Purists may disagree. I think they are wrong. Finally – because you’re no doubt wondering 🙂 – the term “Dirichlet” in LDA refers to the fact that topics and words are assumed to follow Dirichlet distributions. There is no “good” reason for this apart from convenience – Dirichlet distributions provide good approximations to word distributions in documents and, perhaps more important, are computationally convenient. As in my previous articles on text mining, I will use a collection of 30 posts from this blog as an example corpus. The corpus can be downloaded here. I will assume that you have R and RStudio installed. Follow this link if you need help with that. Check out the preprocessing section in either this article or this one for detailed explanations of the code. The document term matrix (DTM) produced by the above code will be the main input into the LDA algorithm of the next section. We are now ready to do some topic modelling. We’ll use the topicmodels package written by Bettina Gruen and Kurt Hornik. Specifically, we’ll use the LDA function with the Gibbs sampling option mentioned earlier, and I’ll say more about it in a second. The LDA function has a fairly large number of parameters. I’ll describe these briefly below. For more, please check out this vignette by Gruen and Hornik. 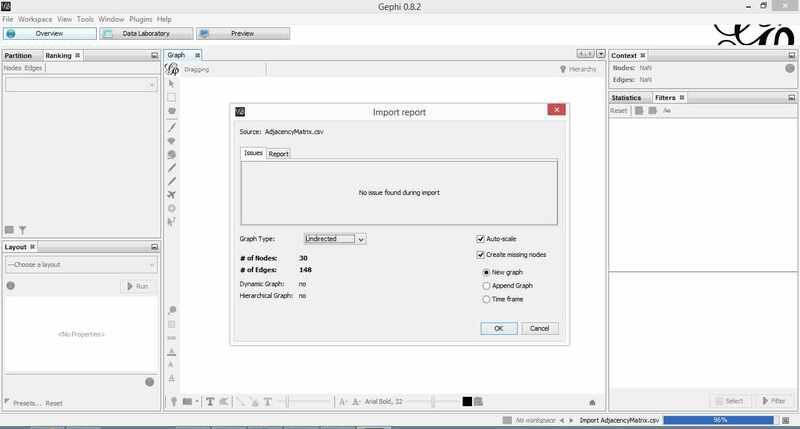 For the most part, we’ll use the default parameter values supplied by the LDA function,custom setting only the parameters that are required by the Gibbs sampling algorithm. Gibbs sampling works by performing a random walk in such a way that reflects the characteristics of a desired distribution. Because the starting point of the walk is chosen at random, it is necessary to discard the first few steps of the walk (as these do not correctly reflect the properties of distribution). This is referred to as the burn-in period. We set the burn-in parameter to 4000. Following the burn-in period, we perform 2000 iterations, taking every 500th iteration for further use. The reason we do this is to avoid correlations between samples. We use 5 different starting points (nstart=5) – that is, five independent runs. Each starting point requires a seed integer (this also ensures reproducibility), so I have provided 5 random integers in my seed list. Finally I’ve set best to TRUE (actually a default setting), which instructs the algorithm to return results of the run with the highest posterior probability. As mentioned earlier, there is an important parameter that must be specified upfront: k, the number of topics that the algorithm should use to classify documents. There are mathematical approaches to this, but they often do not yield semantically meaningful choices of k (see this post on stackoverflow for an example). From a practical point of view, one can simply run the algorithm for different values of k and make a choice based by inspecting the results. This is what we’ll do. OK, so the first step is to set these parameters in R… and while we’re at it, let’s also load the topicmodels library (Note: you might need to install this package as it is not a part of the base R installation). Each document is considered to be a mixture of all topics (5 in this case). The assignments in the first file list the top topic – that is, the one with the highest probability (more about this in point 3 below). Each topic contains all terms (words) in the corpus, albeit with different probabilities. We list only the top 6 terms in the second file. The last file lists the probabilities with which each topic is assigned to a document. This is therefore a 30 x 5 matrix – 30 docs and 5 topics. As one might expect, the highest probability in each row corresponds to the topic assigned to that document. The “goodness” of the primary assignment (as discussed in point 1) can be assessed by taking the ratio of the highest to second-highest probability and the second-highest to the third-highest probability and so on. This is what I’ve done in the last nine lines of the code above. Take some time to examine the output and confirm for yourself that that the primary topic assignments are best when the ratios of probabilities discussed in point 3 are highest. You should also experiment with different values of k to see if you can find better topic distributions. In the interests of space I will restrict myself to k = 5. The table below lists the top 6 terms in topics 1 through 5. From a quick perusal of the two tables it appears that the algorithm has done a pretty decent job. For example,topic 4 is about data and system design, and the documents assigned to it are on topic. 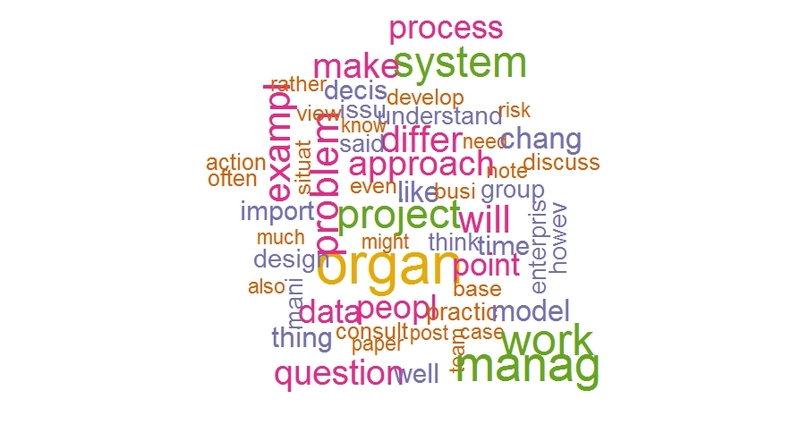 However, it is far from perfect – for example, the interview I did with Neil Preston on organisational change (MakingSenseOfOrganizationalChange.txt) has been assigned to topic 5, which seems to be about project management. It ought to be associated with Topic 3, which is about change. Let’s see if we can resolve this by looking at probabilities associated with topics. In the table, the highest probability in each row is in bold. Also, in cases where the maximum and the second/third largest probabilities are close, I have highlighted the second (and third) highest probabilities in red. It is clear that Neil’s interview (9th document in the above table) has 3 topics with comparable probabilities – topic 5 (project management), topic 3 (change) and topic 2 (issue mapping / ibis), in decreasing order of probabilities. In general, if a document has multiple topics with comparable probabilities, it simply means that the document speaks to all those topics in proportions indicated by the probabilities. A reading of Neil’s interview will convince you that our conversation did indeed range over all those topics. That said, the algorithm is far from perfect. You might have already noticed a few poor assignments. Here is one – my post on Sherlock Holmes and the case of the failed project has been assigned to topic 3; I reckon it belongs in topic 5. There are a number of others, but I won’t belabor the point, except to reiterate that this precisely why you definitely want to experiment with different settings of the iteration parameters (to check for stability) and, more important, try a range of different values of k to find the optimal number of topics. Topic modelling provides a quick and convenient way to perform unsupervised classification of a corpus of documents. As always, though, one needs to examine the results carefully to check that they make sense. I’d like to end with a general observation. 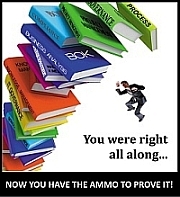 Classifying documents is an age-old concern that cuts across disciplines. So it is no surprise that topic modelling has got a look-in from diverse communities. Indeed, when I was reading up and learning about LDA, I found that some of the best introductory articles in the area have been written by academics working in English departments! This is one of the things I love about working in text analysis, there is a wealth of material on the web written from diverse perspectives. The term cross-disciplinary often tends to be a platitude , but in this case it is simply a statement of fact. I hope that I have been able to convince you to explore this rapidly evolving field. Exciting times ahead, come join the fun. Welcome to the second part of my introductory series on text analysis using R (the first article can be accessed here). My aim in the present piece is to provide a practical introduction to cluster analysis. I’ll begin with some background before moving on to the nuts and bolts of clustering. We have a fair bit to cover, so let’s get right to it. A common problem when analysing large collections of documents is to categorize them in some meaningful way. This is easy enough if one has a predefined classification scheme that is known to fit the collection (and if the collection is small enough to be browsed manually). One can then simply scan the documents, looking for keywords appropriate to each category and classify the documents based on the results. More often than not, however, such a classification scheme is not available and the collection too large. One then needs to use algorithms that can classify documents automatically based on their structure and content. 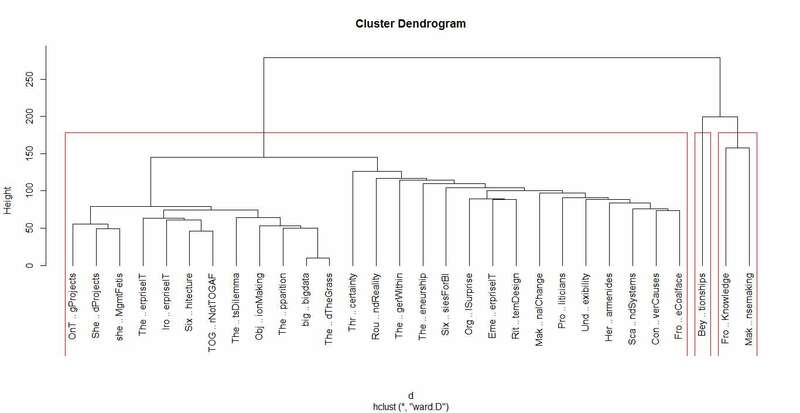 Cluster analysis or clustering is the task of grouping a set of objects in such a way that objects in the same group (called a cluster) are more similar (in some sense or another) to each other than to those in other groups (clusters). Cluster analysis itself is not one specific algorithm, but the general task to be solved. It can be achieved by various algorithms that differ significantly in their notion of what constitutes a cluster and how to efficiently find them. Popular notions of clusters include groups with small distances [Note: we’ll use distance-based methods] among the cluster members, dense areas of the data space, intervals or particular statistical distributions [i.e. distributions of words within documents and the entire collection]. …the notion of a “cluster” cannot be precisely defined, which is one of the reasons why there are so many clustering algorithms. There is a common denominator: a group of data objects. However, different researchers employ different cluster models, and for each of these cluster models again different algorithms can be given. The notion of a cluster, as found by different algorithms, varies significantly in its properties. Understanding these “cluster models” is key to understanding the differences between the various algorithms. An upshot of the above is that it is not always straightforward to interpret the output of clustering algorithms. Indeed, we will see this in the example discussed below. With that said for an introduction, let’s move on to the nut and bolts of clustering. In this section I cover the steps required to create the R objects necessary in order to do clustering. It goes over territory that I’ve covered in detail in the first article in this series – albeit with a few tweaks, so you may want to skim through even if you’ve read my previous piece. To begin with I’ll assume you have R and RStudio (a free development environment for R) installed on your computer and are familiar with the basic functionality in the text mining ™ package. If you need help with this, please look at the instructions in my previous article on text mining. As in the first part of this series, I will use 30 posts from my blog as the example collection (or corpus, in text mining-speak). The corpus can be downloaded here. For completeness, I will run through the entire sequence of steps – right from loading the corpus into R, to running the two clustering algorithms. #set working directory – fix path as needed! Note: R commands are in blue, output in black or red; lines that start with # are comments. If you get an error here, you probably need to download and install the tm package. You can do this in RStudio by going to Tools > Install Packages and entering “tm”. When installing a new package, R automatically checks for and installs any dependent packages. The next step is to load the collection of documents into an object that can be manipulated by functions in the tm package. Note: please see my previous article for more on content_transformer and the toSpace function defined above. Next we remove stopwords – common words (like “a” “and” “the”, for example) and eliminate extraneous whitespaces. At this point it is critical to inspect the corpus because stopword removal in tm can be flaky. Yes, this is annoying but not a showstopper because one can remove problematic words manually once one has identified them – more about this in a minute. Again, it is a good idea to check that the offending words have really been eliminated. The final preprocessing step is to create a document-term matrix (DTM) – a matrix that lists all occurrences of words in the corpus. In a DTM, documents are represented by rows and the terms (or words) by columns. If a word occurs in a particular document n times, then the matrix entry for corresponding to that row and column is n, if it doesn’t occur at all, the entry is 0. This brings us to the end of the preprocessing phase. Next, I’ll briefly explain how distance-based algorithms work before going on to the actual work of clustering. As mentioned in the introduction, the basic idea behind document or text clustering is to categorise documents into groups based on likeness. Let’s take a brief look at how the algorithms work their magic. Consider the structure of the DTM. Very briefly, it is a matrix in which the documents are represented as rows and words as columns. In our case, the corpus has 30 documents and 4131 words, so the DTM is a 30 x 4131 matrix. Mathematically, one can think of this matrix as describing a 4131 dimensional space in which each of the words represents a coordinate axis and each document is represented as a point in this space. This is hard to visualise of course, so it may help to illustrate this via a two-document corpus with only three words in total. 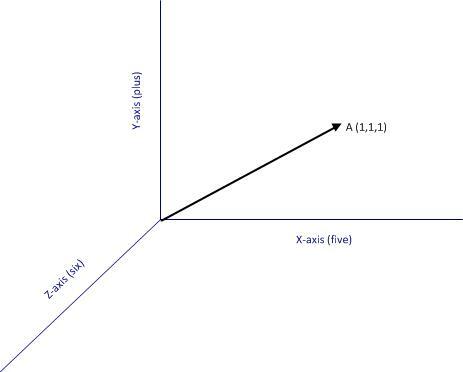 These two documents can be represented as points in a 3 dimensional space that has the words “five” “plus” and “six” as the three coordinate axes (see figure 1). Now, if each of the documents can be thought of as a point in a space, it is easy enough to take the next logical step which is to define the notion of a distance between two points (i.e. two documents). 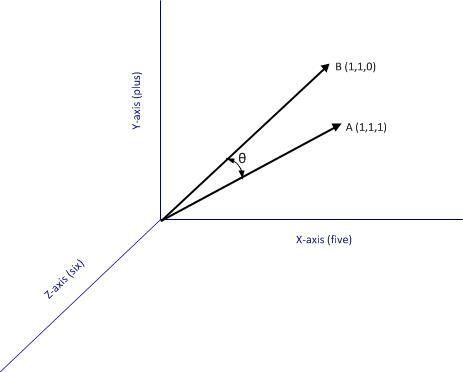 In figure 1 the distance between A and B (which I denote as )is the length of the line connecting the two points, which is simply, the sum of the squares of the differences between the coordinates of the two points representing the documents. What’s important here is the idea that one can define a numerical distance between documents. Once this is grasped, it is easy to understand the basic idea behind how (some) clustering algorithms work – they group documents based on distance-related criteria. To be sure, this explanation is simplistic and glosses over some of the complicated details in the algorithms. Nevertheless it is a reasonable, approximate explanation for what goes on under the hood. I hope purists reading this will agree! Finally, for completeness I should mention that there are many clustering algorithms out there, and not all of them are distance-based. Agglomerative: where we start out with each document in its own cluster. The algorithm iteratively merges documents or clusters that are closest to each other until the entire corpus forms a single cluster. Each merge happens at a different (increasing) distance. Divisive: where we start out with the entire set of documents in a single cluster. At each step the algorithm splits the cluster recursively until each document is in its own cluster. This is basically the inverse of an agglomerative strategy. Find the pair of clusters that are closest to each other and merge them. So you now have one cluster less than before. Compute distances between the new cluster and each of the old clusters. Repeat steps 2 and 3 until you have a single cluster containing all documents. Next we run hclust. The algorithm offers several options check out the documentation for details. I use a popular option called Ward’s method – there are others, and I suggest you experiment with them as each of them gives slightly different results making interpretation somewhat tricky (did I mention that clustering is as much an art as a science??). Finally, we visualise the results in a dendogram (see Figure 2 below). The figures 4 and 5 below show the grouping for 3, and 5 clusters. I’ll make just one point here: the 2 cluster grouping seems the most robust one as it happens at large distance, and is cleanly separated (distance-wise) from the 3 and 5 cluster grouping. That said, I’ll leave you to explore the ins and outs of hclust on your own and move on to our next algorithm. In hierarchical clustering we did not specify the number of clusters upfront. These were determined by looking at the dendogram after the algorithm had done its work. In contrast, our next algorithm – K means – requires us to define the number of clusters upfront (this number being the “k” in the name). The algorithm then generates k document clusters in a way that ensures the within-cluster distances from each cluster member to the centroid (or geometric mean) of the cluster is minimised. Compute the location of the centroid of each bin. Assign each document to the bin corresponding to the centroid closest to it. Stop if no document is moved to a new bin, else go to step 2. An important limitation of the k means method is that the solution found by the algorithm corresponds to a local rather than global minimum (this figure from Wikipedia explains the difference between the two in a nice succinct way). As a consequence it is important to run the algorithm a number of times (each time with a different starting configuration) and then select the result that gives the overall lowest sum of within-cluster distances for all documents. A simple check that a solution is robust is to run the algorithm for an increasing number of initial configurations until the result does not change significantly. That said, this procedure does not guarantee a globally optimal solution. The plot is shown in Figure 6. Running the algorithm and plotting the results for k=3 and 5 yields the figures below. Recall that the k means algorithm requires us to specify k upfront. A natural question then is: what is the best choice of k? In truth there is no one-size-fits-all answer to this question, but there are some heuristics that might sometimes help guide the choice. For completeness I’ll describe one below even though it is not much help in our clustering problem. In my simplified description of the k means algorithm I mentioned that the technique attempts to minimise the sum of the distances between the points in a cluster and the cluster’s centroid. Actually, the quantity that is minimised is the total of the within-cluster sum of squares (WSS) between each point and the mean. Intuitively one might expect this quantity to be maximum when k=1 and then decrease as k increases, sharply at first and then less sharply as k reaches its optimal value. The problem with this reasoning is that it often happens that the within cluster sum of squares never shows a slowing down in decrease of the summed WSS. Unfortunately this is exactly what happens in the case at hand. …and the figure below shows the resulting plot. The plot clearly shows that there is no k for which the summed WSS flattens out (no distinct “elbow”). As a result this method does not help. Fortunately, in this case one can get a sensible answer using common sense rather than computation: a choice of 2 clusters seems optimal because both algorithms yield exactly the same clusters and show the clearest cluster separation at this point (review the dendogram and cluster plots for k=2). Now I must acknowledge an elephant in the room that I have steadfastly ignored thus far. The odds are good that you’ve seen it already…. 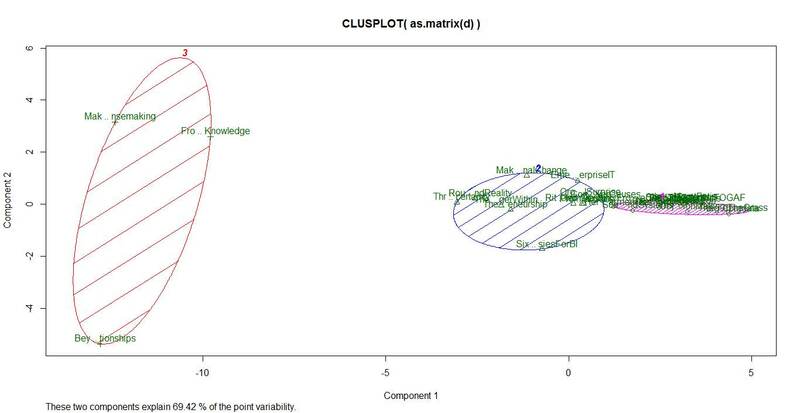 It is this: what topics or themes do the (two) clusters correspond to? The criteria for the construction of the DTM (see the documentation for DocumentTermMatrix for options). Indeed, insofar as clustering is concerned, subject matter and corpus knowledge is the best way to figure out cluster themes. This serves to reinforce (yet again!) that clustering is as much an art as it is a science. 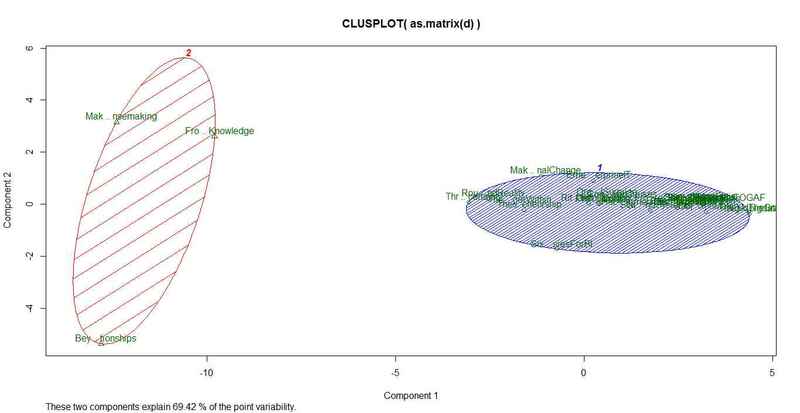 The take home lesson is that is that the results of clustering are often hard to interpret. This should not be surprising – the algorithms cannot interpret meaning, they simply chug through a mathematical optimisation problem. The onus is on the analyst to figure out what it means…or if it means anything at all. This brings us to the end of a long ramble through clustering. We’ve explored the two most common methods: hierarchical and k means clustering (there are many others available in R, and I urge you to explore them). Apart from providing the detailed steps to do clustering, I have attempted to provide an intuitive explanation of how the algorithms work. I hope I have succeeded in doing so. As always your feedback would be very welcome. 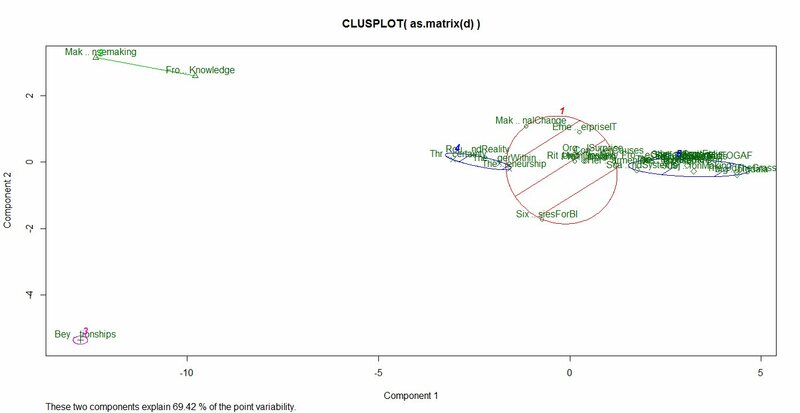 Finally, I’d like to reiterate an important point: the results of our clustering exercise do not have a straightforward interpretation, and this is often the case in cluster analysis. Fortunately I can close on an optimistic note. There are other text mining techniques that do a better job in grouping documents based on topics and themes rather than word frequencies alone. I’ll discuss this in the next article in this series. Until then, I wish you many enjoyable hours exploring the ins and outs of clustering. If you liked this article, you might want to check out its sequel – an introduction to topic modeling. This article is based on my exploration of the basic text mining capabilities of R, the open source statistical software. It is intended primarily as a tutorial for novices in text mining as well as R. However, unlike conventional tutorials, I spend a good bit of time setting the context by describing the problem that led me to text mining and thence to R. I also talk about the limitations of the techniques I describe, and point out directions for further exploration for those who are interested. Indeed, I’ll likely explore some of these myself in future articles. A couple of warnings are in order before we proceed. R and the text mining options we explore below are open source software. Version differences in open source can be significant and are not always documented in a way that corporate IT types are used to. Indeed, I was tripped up by such differences in an earlier version of this article (now revised). So, just for the record, the examples below were run on version 3.2.0 of R and version 0.6-1 of the tm (text mining) package for R. A second point follows from this: as is evident from its version number, the tm package is still in the early stages of its evolution. As a result – and we will see this below – things do not always work as advertised. So assume nothing, and inspect the results in detail at every step. Be warned that I do not always do this below, as my aim is introduction rather than accuracy. Traditional data analysis is based on the relational model in which data is stored in tables. Within tables, data is stored in rows – each row representing a single record of an entity of interest (such as a customer or an account). The columns represent attributes of the entity. For example, the customer table might consist of columns such as name, street address, city, postcode, telephone number . Typically these are defined upfront, when the data model is created. It is possible to add columns after the fact, but this tends to be messy because one also has to update existing rows with information pertaining to the added attribute. As a result of the above, many data modelers will include a “catch-all” free text column that can be used to capture additional information in an ad-hoc way. As one might imagine, this column will often end up containing several lines, or even paragraphs of text that are near impossible to analyse with the tools available in relational databases. Over the last few months, when time permits, I’ve been doing an in-depth exploration of the data captured by my organisation’s IT service management tool. Such tools capture all support tickets that are logged, and track their progress until they are closed. As it turns out, there are a number of cases where calls are logged against categories that are too broad to be useful – the infamous catch-all category called “Unknown.” In such cases, much of the important information is captured in a free text column, which is difficult to analyse unless one knows what one is looking for. The problem I was grappling with was to identify patterns and hence define sub-categories that would enable support staff to categorise these calls meaningfully. One way to do this is to guess what the sub-categories might be…and one can sometimes make pretty good guesses if one knows the data well enough. In general, however, guessing is a terrible strategy because one does not know what one does not know. The only sensible way to extract subcategories is to analyse the content of the free text column systematically. This is a classic text mining problem. Now, I knew a bit about the theory of text mining, but had little practical experience with it. So the logical place for me to start was to look for a suitable text mining tool. Our vendor (who shall remain unnamed) has a “Rolls-Royce” statistical tool that has a good text mining add-on. We don’t have licenses for the tool, but the vendor was willing to give us a trial license for a few months…with the understanding that this was on an intent-to-purchase basis. I therefore started looking at open source options. While doing so, I stumbled on an interesting paper by Ingo Feinerer that describes a text mining framework for the R environment. Now, I knew about R, and was vaguely aware that it offered text mining capabilities, but I’d not looked into the details. Anyway, I started reading the paper…and kept going until I finished. As I read, I realised that this could be the answer to my problems. Even better, it would not require me trade in assorted limbs for a license. I decided to give it a go. R can be downloaded from the R Project website. There is a Windows version available, which installed painlessly on my laptop. Commonly encountered installation issues are answered in the (very helpful) R for Windows FAQ. RStudio is an integrated development environment (IDE) for R. There is a commercial version of the product, but there is also a free open source version. In what follows, I’ve used the free version. Like R, RStudio installs painlessly and also detects your R installation. A script editor in which you can create R scripts (top left). You can also open a new script editor window by going to File > New File > RScript. Files in the current working directory, installed R packages, plots and a help display screen (bottom right). Check out this short video for a quick introduction to RStudio. You can access help anytime (within both R and RStudio) by typing a question mark before a command. Exercise: try this by typing ?getwd() and ?setwd() in the console. I should reiterate that the installation process for both products was seriously simple…and seriously impressive. “Rolls-Royce” business intelligence vendors could take a lesson from that…in addition to taking a long hard look at the ridiculous prices they charge. tm – the text mining package (see documentation). 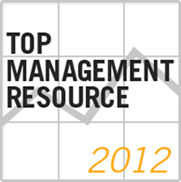 Also check out this excellent introductory article on tm. SnowballC – required for stemming (explained below). wordcloud – which is self-explanatory (see documentation) . The simplest way to install packages is to use RStudio’s built in capabilities (go to Tools > Install Packages in the menu). If you’re working on Windows 7 or 8, you might run into a permissions issue when installing packages. If you do, you might find this advice from the R for Windows FAQ helpful. The data I had from our service management tool isn’t the best dataset to learn with as it is quite messy. But then, I have a reasonable data source in my virtual backyard: this blog. To this end, I converted all posts I’ve written since Dec 2013 into plain text form (30 posts in all). You can download the zip file of these here . I suggest you create a new folder called – called, say, TextMining – and unzip the files in that folder. In what follows, I enter the commands directly in the console. However, here’s a little RStudio tip that you may want to consider: you can enter an R command or code fragment in the script editor and then hit Ctrl-Enter (i.e. hit the Enter key while holding down the Control key) to copy the line to the console. This will enable you to save the script as you go along. In the code snippets below, the functions / commands to be typed in the R console are in blue font. The output is in black. I will also denote references to functions / commands in the body of the article by italicising them as in “setwd()”. Be aware that I’ve omitted the command prompt “>” in the code snippets below! It is best not to cut-n-paste commands directly from the article as quotes are sometimes not rendered correctly. A text file of all the code in this article is available here. The > prompt in the RStudio console indicates that R is ready to process commands. You can now use getwd()to check that setwd() has done what it should. I won’t say much more here about R as I want to get on with the main business of the article. Check out this very short introduction to R for a quick crash course. Start RStudio and open the TextMining project you created earlier. Dependent packages are loaded automatically – in this case the dependency is on the NLP (natural language processing) package. At the risk of stating the obvious, you will need to tailor this path as appropriate. A couple of things to note in the above. Any line that starts with a # is a comment, and the “<-“ tells R to assign the result of the command on the right hand side to the variable on the left hand side. In this case the Corpus object created is stored in a variable called docs. One can also use the equals sign (=) for assignment if one wants to. The summary() function gives more details, including a complete listing of files…but it isn’t particularly enlightening. Instead, we’ll examine a particular document in the corpus. Which prints the entire content of 30th document in the corpus to the console. Data cleansing, though tedious, is perhaps the most important step in text analysis. As we will see, dirty data can play havoc with the results. Furthermore, as we will also see, data cleaning is invariably an iterative process as there are always problems that are overlooked the first time around. Most of these are self-explanatory. I’ll explain those that aren’t as we go along. There are a few preliminary clean-up steps we need to do before we use these powerful transformations. If you inspect some documents in the corpus (and you know how to do that now), you will notice that I have some quirks in my writing. For example, I often use colons and hyphens without spaces between the words separated by them. Using the removePunctuation transform without fixing this will cause the two words on either side of the symbols to be combined. Clearly, we need to fix this prior to using the transformations. To fix the above, one has to create a custom transformation. The tm package provides the ability to do this via the content_transformer function. This function takes a function as input, the input function should specify what transformation needs to be done. In this case, the input function would be one that replaces all instances of a character by spaces. As it turns out the gsub() function does just that. Inspect random sections f corpus to check that the result is what you intend (use writeLines as shown earlier). To reiterate something I mentioned in the preamble, it is good practice to inspect the a subset of the corpus after each transformation. Inspecting the corpus reveals that several “non-standard” punctuation marks have not been removed. These include the single curly quote marks and a space-hyphen combination. These can be removed using our custom content transformer, toSpace. Note that you might want to copy-n-paste these symbols directly from the relevant text file to ensure that they are accurately represented in toSpace. Inspect the corpus again to ensure that the offenders have been eliminated. This is also a good time to check for any other special symbols that may need to be removed manually. Since R is case sensitive, “Text” is not equal to “text” – and hence the rationale for converting to a standard case. However, although there is a tolower transformation, it is not a part of the standard tm transformations (see the output of getTransformations() in the previous section). For this reason, we have to convert tolower into a transformation that can handle a corpus object properly. This is done with the help of our new friend, content_transformer. Text analysts are typically not interested in numbers since these do not usually contribute to the meaning of the text. However, this may not always be so. For example, it is definitely not the case if one is interested in getting a count of the number of times a particular year appears in a corpus. This does not need to be wrapped in content_transformer as it is a standard transformation in tm. Once again, be sure to inspect the corpus before proceeding. Typically a large corpus will contain many words that have a common root – for example: offer, offered and offering. Stemming is the process of reducing such related words to their common root, which in this case would be the word offer. Simple stemming algorithms (such as the one in tm) are relatively crude: they work by chopping off the ends of words. This can cause problems: for example, the words mate and mating might be reduced to mat instead of mate. That said, the overall benefit gained from stemming more than makes up for the downside of such special cases. Now let’s stem the corpus and reinspect it. A careful comparison of the two paragraphs reveals the benefits and tradeoff of this relatively crude process. There is a more sophisticated procedure called lemmatization that takes grammatical context into account. Among other things, determining the lemma of a word requires a knowledge of its part of speech (POS) – i.e. whether it is a noun, adjective etc. There are POS taggers that automate the process of tagging terms with their parts of speech. Although POS taggers are available for R (see this one, for example), I will not go into this topic here as it would make a long post even longer. Note that I have removed the stop words and and in in the 3rd and 4th transforms above. There are definitely other errors that need to be cleaned up, but I’ll leave these for you to detect and remove. The next step in the process is the creation of the document term matrix (DTM)– a matrix that lists all occurrences of words in the corpus, by document. In the DTM, the documents are represented by rows and the terms (or words) by columns. If a word occurs in a particular document, then the matrix entry for corresponding to that row and column is 1, else it is 0 (multiple occurrences within a document are recorded – that is, if a word occurs twice in a document, it is recorded as “2” in the relevant matrix entry). Clearly there is nothing special about rows and columns – we could just as easily transpose them. If we did so, we’d get a term document matrix (TDM) in which the terms are rows and documents columns. One can work with either a DTM or TDM. I’ll use the DTM in what follows. There are a couple of general points worth making before we proceed. Firstly, DTMs (or TDMs) can be huge – the dimension of the matrix would be number of document x the number of words in the corpus. Secondly, it is clear that the large majority of words will appear only in a few documents. As a result a DTM is invariably sparse – that is, a large number of its entries are 0. This is a 30 x 4209 dimension matrix in which 89% of the rows are zero. This command displays terms 1000 through 1005 in the first two rows of the DTM. Note that your results may differ. Notice that in constructing the TDM, we have converted a corpus of text into a mathematical object that can be analysed using quantitative techniques of matrix algebra. It should be no surprise, therefore, that the TDM (or DTM) is the starting point for quantitative text analysis. Here we have first converted the TDM into a mathematical matrix using the as.matrix() function. We have then summed over all rows to give us the totals for each column (term). The result is stored in the (column matrix) variable freq. The least frequent terms can be more interesting than one might think. This is because terms that occur rarely are likely to be more descriptive of specific documents. Indeed, I can recall the posts in which I have referred to Yorkshire, Zeno’s Paradox and Mr. Lou Zulli without having to go back to the corpus, but I’d have a hard time enumerating the posts in which I’ve used the word system. There are at least a couple of ways to simple ways to strike a balance between frequency and specificity. One way is to use so-called inverse document frequencies. A simpler approach is to eliminate words that occur in a large fraction of corpus documents. The latter addresses another issue that is evident in the above. We deal with this now. Here we have told R to include only those words that occur in 3 to 27 documents. We have also enforced lower and upper limit to length of the words included (between 4 and 20 characters). The dimension is reduced to 30 x 1290. The results make sense: the top 6 keywords are pretty good descriptors of what my blogs is about – projects, management and systems. However, not all high frequency words need be significant. What they do, is give you an idea of potential classification terms. 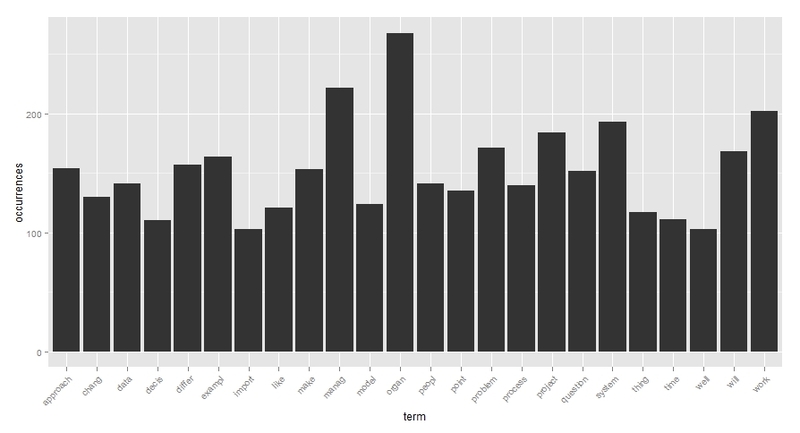 Here I have asked findFreqTerms() to return all terms that occur more than 80 times in the entire corpus. Note, however, that the result is ordered alphabetically, not by frequency. Now that we have the most frequently occurring terms in hand, we can check for correlations between some of these and other terms that occur in the corpus. In this context, correlation is a quantitative measure of the co-occurrence of words in multiple documents. The tm package provides the findAssocs() function to do this. One needs to specify the DTM, the term of interest and the correlation limit. The latter is a number between 0 and 1 that serves as a lower bound for the strength of correlation between the search and result terms. For example, if the correlation limit is 1, findAssocs() will return only those words that always co-occur with the search term. A correlation limit of 0.5 will return terms that have a search term co-occurrence of at least 50% and so on. Here are the results of running findAssocs() on some of the frequently occurring terms (system, project, organis) at a correlation of 60%. That said, one can already see that the correlations throw up interesting combinations – for example, project and manag, or enterpris and agil or architect/architecture, or system and design or adopt. These give one further insights into potential classifications. As it turned out, the very basic techniques listed above were enough for me to get a handle on the original problem that led me to text mining – the analysis of free text problem descriptions in my organisation’s service management tool. What I did was to work my way through the top 50 terms and find their associations. These revealed a number of sets of keywords that occurred in multiple problem descriptions, which was good enough for me to define some useful sub-categories. These are currently being reviewed by the service management team. While they’re busy with that that, I’m looking into refining these further using techniques such as cluster analysis and tokenization. A simple case of the latter would be to look at two-word combinations in the text (technically referred to as bigrams). As one might imagine, the dimensionality of the DTM will quickly get out of hand as one considers larger multi-word combinations. Anyway, all that and more will topics have to wait for future articles as this piece is much too long already. That said, there is one thing I absolutely must touch upon before signing off. Do stay, I think you’ll find it interesting. One of the really cool things about R is its graphing capability. I’ll do just a couple of simple examples to give you a flavour of its power and cool factor. There are lots of nice examples on the Web that you can try out for yourself. Figure 1 shows the result. The first line creates a data frame – a list of columns of equal length. A data frame also contains the name of the columns – in this case these are term and occurrence respectively. We then invoke ggplot(), telling it to consider plot only those terms that occur more than 100 times. The aes option in ggplot describes plot aesthetics – in this case, we use it to specify the x and y axis labels. The stat=”identity” option in geom_bar () ensures that the height of each bar is proportional to the data value that is mapped to the y-axis (i.e occurrences). The last line specifies that the x-axis labels should be at a 45 degree angle and should be horizontally justified (see what happens if you leave this out). Check out the voluminous ggplot documentation for more or better yet, this quick introduction to ggplot2 by Edwin Chen. The result is shown Figure 2. Here we first load the wordcloud package which is not loaded by default. Setting a seed number ensures that you get the same look each time (try running it without setting a seed). The arguments of the wordcloud() function are straightforward enough. Note that one can specify the maximum number of words to be included instead of the minimum frequency (as I have done above). 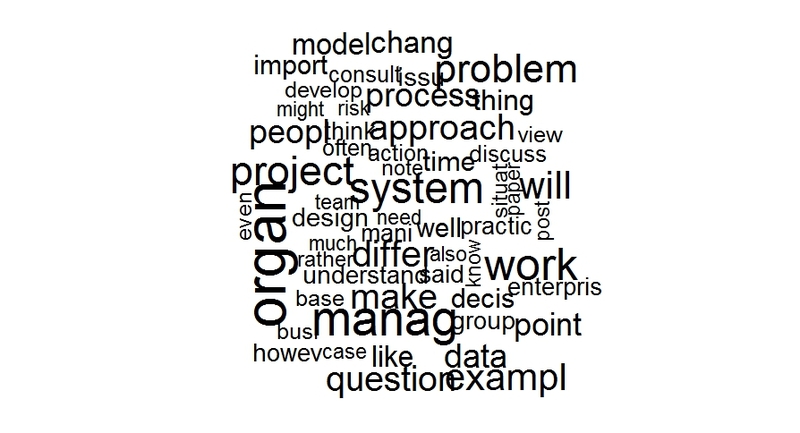 See the word cloud documentation for more. This word cloud also makes it clear that stop word removal has not done its job well, there are a number of words it has missed (also and however, for example). These can be removed by augmenting the built-in stop word list with a custom one. This is left as an exercise for the reader :-). The result is shown Figure 3. You may need to load the RColorBrewer package to get this to work. Check out the brewer documentation to experiment with more colouring options. This brings me to the end of this rather long (but I hope, comprehensible) introduction to text mining R. It should be clear that despite the length of the article, I’ve covered only the most rudimentary basics. Nevertheless, I hope I’ve succeeded in conveying a sense of the possibilities in the vast and rapidly-expanding discipline of text analytics. 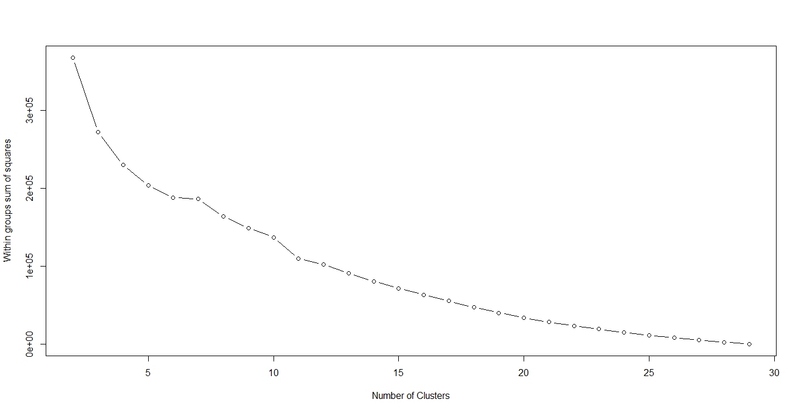 If you liked this piece, you may want to check out the sequel – a gentle introduction to cluster analysis using R.
…and my introductory piece on topic modeling. …and my article on visualizing relationships between documents.